Celtic are reported to have made a bid for Anthony Stokes and could sign the striker before the transfer window closes. 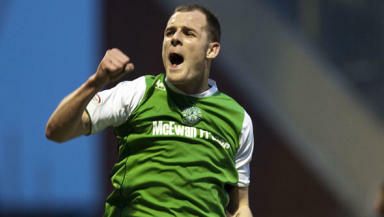 Hibernian striker Anthony Stokes is a signing target for Celtic. Neil Lennon has confirmed the player is among those he is looking at as he attempts to finalise his squad before the transfer window closes on Tuesday. Celtic could make the striker their 11th signing of the summer, if they have a bid accepted by Hibs and The Scotsman has reported that an initial offer of around £800,000 has already been rejected by the Edinburgh club. The Glasgow club have been busy in the transfer market already this summer but are believed to be ready to make further changes in the striking department. Gary Hooper has been recruited from Scunthorpe United but is sidelined until October by injury. Craig Bellamy had been offered a loan deal to move to Parkhead but opted to join hometown club Cardiff City instead, leaving Lennon to pursue other avenues as he seeks to put together a title-winning team. Morten Rasmussen has been allowed to join German side Mainz, while there has been speculation over the future of Marc-Antoine Fortune and Georgios Samaras, who both started the Europa League match in Holland on Thursday. Stokes is believed to be the number one target to bolster the frontline but Celtic may have to bid more than £1 million to land the 22-year old striker. The former Arsenal youth player scored 23 goals for Hibs last season and is already off the mark this term, having scored in the 3-2 win over Motherwell earlier this month. Hibs would be reluctant to lose their top goalscorer with little time available to bring in a replacement. However, the Easter Road club would be prepared to sell if they receive an offer that meets their valuation. The transfer window closes at the end of August though, meaning there are only five days to conclude a deal. That puts Hibs in a strong bargaining position and may force Celtic to improve on their initial bid if they do not switch to other targets over the next few days.